This was my entry for the IPP Design competition in Antwerp. It won the People's choice award and took a first prize by the judges. It is the first puzzle to win two awards at the show. 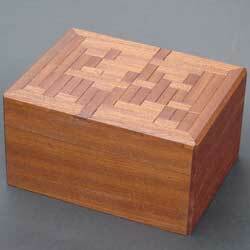 This puzzle is made from Sapele, and Maple. Sapele is exterior wood. 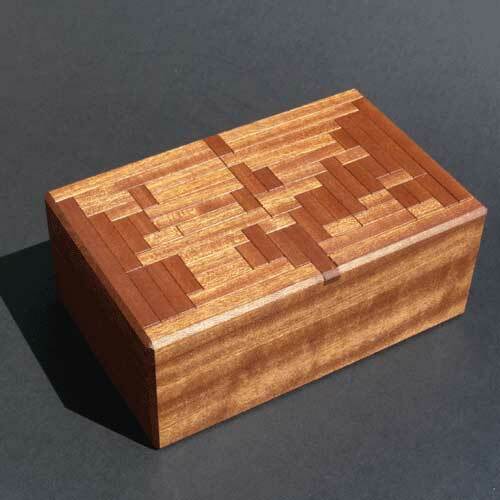 Each sliding tile on the top of the box is carefully cut with a miniature tongue and groove. The sliding block puzzle is deceptively difficult. It requires over eighty moves to solve at its hardest setting. It also has three easier settings. By this I mean that you can rearrange the tiles four different ways and keep the box at its initial starting position. The lid of the box opens up on a special hinge, I have designed that raises the lid up and swivels it out from the base. This allows for the box seam to be cut without any recess in the back portion behind the hinge. The rectangle on the top of the box is proportioned 13 x 21. You can count this out if you count the number of tile widths each side contains, counting the border. 13 and 21 is a special pair of numbers because it is part of the Fibonacci sequence. The higher the Fibonacci Pair, the closer it resembles a special ratio called the Golden Ratio. Inside of the Block Box I made as a first run. 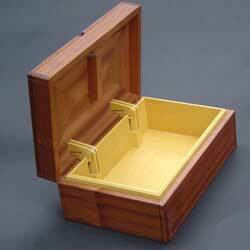 The yellow wood is called Brazilian Satinwood.